When I was a young boy, "war time" nickels were still in circulation. I don't mean you'd find one once in a while, I mean that you could find as many as you wanted. At one time I had rolls and rolls of them, and "errors" like the one shown below were very common. I put "errors" in quotes because I never thought of them as errors - I thought of them as defects, and wouldn't even think of putting those in a holder to be kept. I'm sure there were plenty of these in the rolls I saved, but I sold all those for their silver content somewhere along the line. 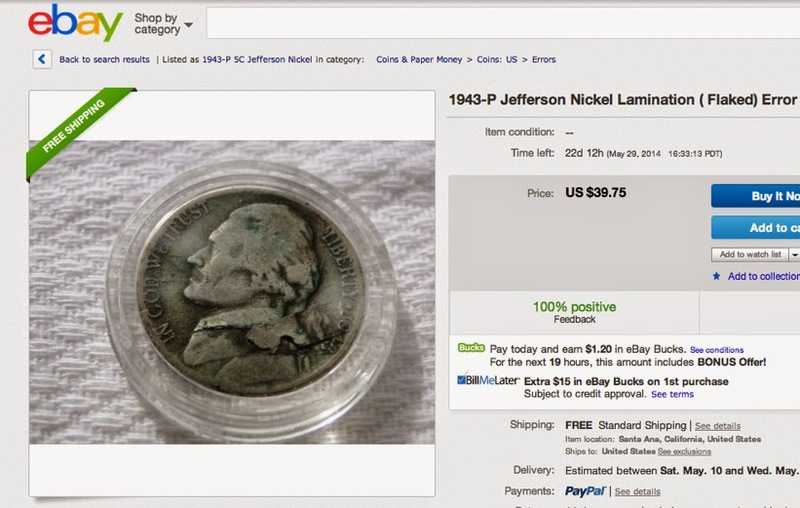 I'm surprised to see that ANACS and NGC certify lamination errors and even more surprised by the prices! Eighty nine dollars? Are you kidding me? Oh, well. I missed the boat on those, for sure!